It might go without saying at this point - since I am far from the first to say it - but if I may, I’d like to echo what the e-learning industry has been voicing recently: The Learning Management System (LMS) is broken. I wouldn’t agree that the LMS is dead, but it’s certainly broken. As a Learning and Development (L&D) professional, learning administrator, and course designer, I’ve spent my fair share of time working in different LMSs. I’ve found myself frustrated with the typical user interface and the non-sensical user experience of these clunky platforms. A significant amount of that frustration was my own, but I also fielded a good deal of complaints from the employees who I serviced. This is partly because LMSs don’t align well with real-world processes, or the nature of day-to-day work within an operation, or employee performance needs. The result is a lot of time and money spent - precious organizational resources wasted. Why is the LMS in such dilapidated shape? Perhaps the most prevalent reason for this disconnection is overreliance on large LMS vendors who provide one-size-fits-all solutions - systems with numerous, complex features, many of which are neither necessary or relevant within an organization. Smaller vendors are not that much better - because they are often competing for the same contracts and potential customers, smaller vendors mimic the larger vendors. The rigid list of user requirements is therefore homogenous across the board. I once worked within an LMS that provided a lot of bells and whistles (which I didn’t need), and yet at the same time, it failed to provide a necessary quizzing feature. This rendered the system virtually useless. There is an incredible deluge of LMS vendors in the marketplace who are all (more or less) offering the same glut of meaningless functionality. One size-fits-all is poisonous. Granted, the typical LMS focuses on content delivery, tracking, and reporting, and therefore a LMS can manage compliance training very well. A lot of what drives market demand for the LMS is need for compliance training management (think sexual harassment training for Human Resources or SOP training compliance within regulated food and drug industries). More often than not, it is compliance and regulatory mandates which define user requirements and drive selection of a vendor. There is nothing inherently flawed with that – in fact, it is imperative to manage compliance effectively. The problem is that leadership within most organizations don’t typically go beyond the high-level needs to uncover the specific functional needs of front-line employees. Upper and middle management is typically disconnected from day-to-day operations of line employees and often unappreciative of the nature of that work. Therefore, LMS user requirements (generally) don’t consider those details, and LMS implementations are often a reflection of manager-employee disconnect. On one hand, the skewed LMS marketplace has made vendors complacent – they don’t need to fundamentally change things up. And on the other hand, the nature of organizational management has meant that customers are not asking for better solutions - they are satisfied with managing compliance outcomes, and they are not properly advocating for front-line employee functional needs. Innovation has stagnated. Without an impetus to change from either the vendor side or customer side, the world of learning management (the LMS, at any rate) could continue to be broken. It is not enough to listen to the customer at the high level and deal with generic user requirements (B2B sales deal with these high-level contractual transactions). To reconnect end users with a LMS (specifically, the people who actually use the LMS) system developers must get as close to those end users as possible, gather as many job-specific details as possible, and craft User Interface (UI) and User Experience (UX) functionality which is an accurate reflection of real day-to-day work and operations. Dossier Solutions leverages a circular design process used by the technology innovation giants of Silicon Valley. Customer feedback drives continuous improvement, iteratively, over time. Web Based Training (WBT) and Virtual Instructor Led Training (VILT) are typically the lion’s share of what you’ll be disseminating and tracking around when you use an LMS. You’ll also see lot of read-and-understand training, such as SOPs and policy documents, which require a digital signature for completion. As stated before, the LMS is a handy tool for administering mandatory compliance training on regulatory requirements and/or internal policies. It can (and should) generate an auditable trail of training documentation. Any worthwhile LMS does these things – it’s almost standard. However, Dossier goes beyond standard compliance training management to offer competency management. This is where they help weave workplace skill and compliance requirements into a broader, more holistic picture of organizational effectiveness – one that includes professional development, performance management, succession planning, and strategic capability development. 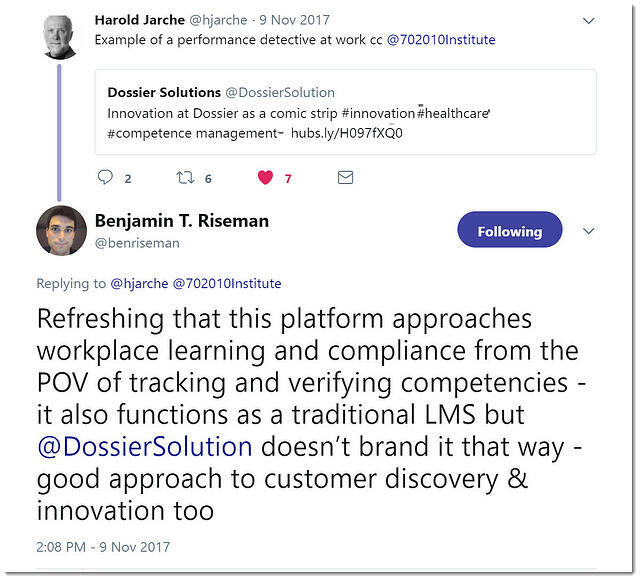 In this way, Dossier effectively fixes the LMS, reconnects people to the learning process, and enables stakeholders to accomplish key strategic outcomes. 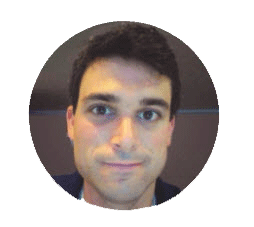 Ben Riseman is a U.S./New England-based learning and development consultant focused on solving the thorniest issues within organizations. He’s an avid adopter of learning technology and enjoys utilizing online and software applications to develop courses, instructional material, and curricula. Full disclosure – The author was compensated for the time it took to write this article.